Lenovo is maintaining its status in Virtual Reality (VR) with the Mirage series of products. With the “Lenovo Mirage Solo” Standalone VR Headset you can get an immersive experience at a reasonable price; The “Lenovo Mirage Camera” is the most affordable VR-Ready Photo and Video Camera for content creators to get started. We review both of these today. The Lenovo Mirage Solo with Daydream – around $375 – brings many of the best qualities of VR headsets to a cord-less unit, at a good price. We like there is an abundant, and growing, amount of content available through Google Daydream (including Games, Experiences, Live Action, Cinema, etc.). A quick look on the Google sites show at least 250 different items to choose from, with more being added regularly. 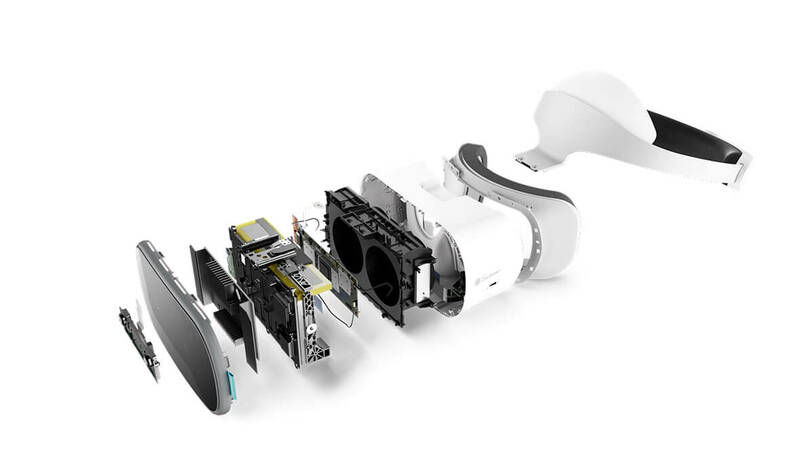 What most sets the Mirage Solo apart from Oculus Go, Samsung Gear VR and Daydream View is the 6DOF (degrees of freedom), which they call “WorldSense”. The DOF determine how your movements, like jumping, stepping, leaning are tracked in VR. More importantly, this manages matching the virtual environment with you head positioning. So as you look around and tilt your head, the VR images update and generate the content for where you are looking. It accomplishes this trick through “inside-out-tracking”. This uses multiple motion sensors (gyro, accelerometer) plus two wide-angle fish-lens cameras on the face of the headset to accurately position you in the virtual world. But…you are limited to just a few feet in any direction with the Solo since it doesn’t have the capability to recognize specific furniture, walls or other real-world hazards. There are built-in proximity sensors to detect the position of nearby objects and measure depth, but it this could use more refinement. It does know where the floor is, since that’s needed to orient you in the VR space. If you move too quickly, the vision goes to black, and you’ll get a warning message to step back into the safety zone circle. Hopefully, Lenovo will come up with some more advanced software to allow the front facing cameras the ability to identify objects and give greater range of motion. You get an impressive 75 Hz constant refresh rate on the 5.5-inch LCD screen. This is a nice upgrade from other stand-alone headsets that run around 60~65 Hz. The QHD (2560 x 1440) resolution is also good, and you shouldn’t experience any eye-strain even after draining the battery. Field of Vision (FOV) is similar to other headsets, at 110-degrees, using 2 Fresnel-Aspheric lenses. The image quality also well represents reality with a 16.7 Million combination color depth, and 70% color gamut coverage. Overall, we’d give the display characteristics and “A+”. The Solo has sufficient memory for gaming, experiencing and video streaming. It has built-in 4 GB RAM / 64 GB UFS ROM, and there is a microSD card that supports up to 256 GB capacity. The unit is driven by the Qualcomm Snapdragon 835 VR platform processor, designed specifically for mobile platforms. This also handles all the wireless communications for the headset. Second to the Display, is the Controller for navigating your VR world. If you are familiar with Google’s Daydream View, then you’ll recognize the Solo control as it’s the same one. Responsiveness it good, and it tracks well with the headset. You’ll get the standard 3 DOF in the wireless, motion-enabled controller. A true immersive experience needs excellent audio in addition to the video. Fortunately, the “Android-N Pro Audio” does the job. Just be sure to get a comfortable pair of wired earbuds to plug into the 3.5mm Audio Jack. The headset has built-in dual microphones, so in-game or other communications is pretty good. For a stand-alone, the battery life is critical. We like the 4000 mAh, Li-ion Polymer battery provides a typical 2.5-hours of usage before needing a recharge. A large reason for the extended battery life is the Snapdragon 835 processor which is about 25%~35% more power efficient than other micros. Last, but maybe most important, is how this feels on your head. As a stand-alone, all the weight is in the head-set. We like that at 8.03” x 10.61” x 7.08” and1.42 lbs this is comfortable, and the dial-in adjustments keep it securely on during game-play. All the contact areas are also nicely padded, which makes a good seal to block out external light. And if being a VR participant isn’t enough, Lenovo lets you get in on creating your own content with their Mirage Camera – about $275. Now you can easily create and share your own immersive virtual reality content. We like the Lenovo Mirage Solo and think it’s worth the price for a mid-level stand-alone VR headset. It’s great that you don’t need a smartphone, PC or even cables to get a great immersive experience. The WorldSense 6DOF provides good movement tracking, and doesn’t need any external sensors like some other units. There is a good library of content, including the much acclaimed Blade Runner: Revelations app, and more on the way. We recommend going to Amazon to order the Lenovo Mirage Solo with Daydream and getting started with your VR immersion. And pick up the Mirage Camera to start making your own VR experiences.